Cold, snowy winter weather provides the perfect time to plan a spring road trip to see some cool local art. Art towns, big and small, around the country are well known. There's a book listing the top 100 best art towns. American Craft Week held a vote-in competition for the best art town during their 2015 event. Some town names keep popping up in all the lists, like Asheville, N.C., Berea, Ky., Sante Fe, NM., Eureka Springs, Ark., Saugatuck, Mich., and as far as States are concerned North Carolina and Vermont always top everyone's list. These are all excellent choices, Asheville and Berea are among my favorites and Vermont is definitely a wonderland of art. But I am going to give you a few fresh ideas. Get the atlas out and start plotting and planning. 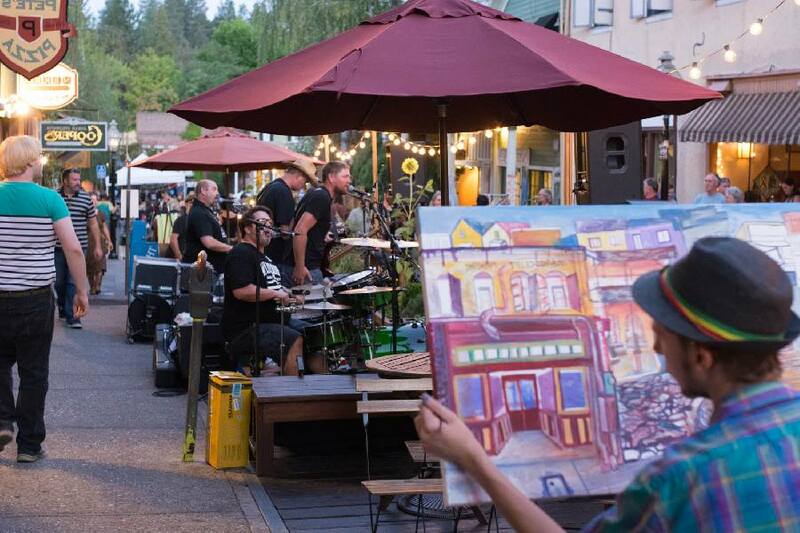 Local artist Kyle Kingston live paints to the music of MAU at The Nevada City Boardwalk . Photo Credit C Theobald Photography. A delightful gold rush town, Nevada City, Calif., lies nestled in the Sierra Nevada mountains just off I-80. They boast a very lively art scene with visual arts, music, theater and an active community. They hold monthly planned first Friday art walks and events from May through October heavily marketed on social media. 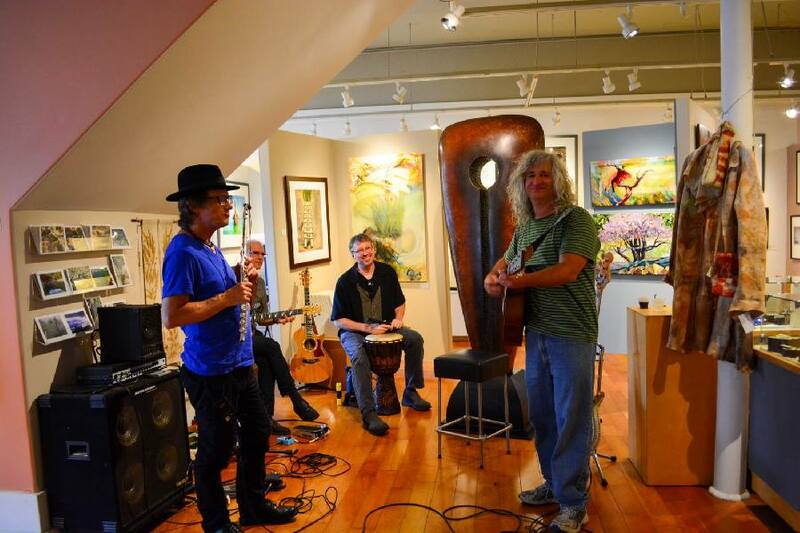 First Friday Artwalk Artist Receptions in 2015. Photo Credit : C Theobald Photography. During the winter months the artists studio, galleries, theaters, live music venues and boutiques are still there obviously but the action mostly takes places inside, not surprising given the weather, but some are still out side.They hold a Nevada City Craft Fair in December. The Nevada City Victorian Christmas fair is their version of the European Christmas Markets and they are held on three Sundays and two Wednesdays during December when tents pop up and life gets festive in the town. If you have the time pop next door to Grass Valley and check out their art scene. The two towns work together in promoting the arts. 3-D Mural on the side of Ventero's building in San Luis, CO.
the bottom right hand corner of Colorado to the San Luis Valley. 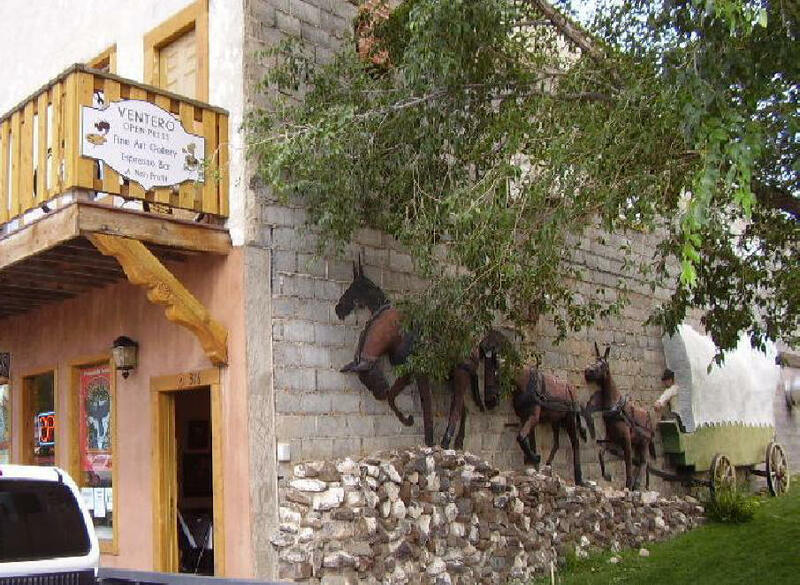 About an hour north of Taos is the little town of San Luis, the oldest town in Colorado. Art has been in the air for some time with, among other artists through the years, sculptor, Huberto Maestas, a San Luis native and creator of the town's Stations of the Cross Shrine. On the atmospheric old main street, Ventero Open Press Fine Art opened their doors a few years ago. As well as the print making and studio rental with lessons, the organization encompasses a fine art gallery featuring regional artists, an espresso bar and they have open-mike entertainment evenings. Ventero is the brain child of Randy Pijoan, an energizer bunny-type and renown print maker and artist. More artistic types are moving north because of rising costs of Taos and Sante Fe and for the peace of the San Luis Valley. Artists are also exploring the areas around the tiny hamlets of Jaroso and Mesita. Although it's not in the valley, neighboring La Veta located at the base of the Spanish Peaks is another burgeoning art town. The La Veta School of the Arts and the Spanish Peaks Arts Council lead the pack. The small town of Gulfport, Florida plays an important role in this day and age. It is to remind us of a gentler time. The friendly, low-rise small art town, reminiscent of a Florida of yesteryear, is tucked in to a quiet backwater on Florida's fast paced coast of high rises and crowded beaches around St Petersburg. Inspired to make their mark, they host a year round bi-monthly art walk every first Friday and third Saturday. To make life easier, there is a free Gulfport Trolley, provided by the City of Gulfport, which runs at every Art Walk. They provide a map and route, and the trolley may be hailed anywhere along the route. Local artists set up their tents alongside the shops and restaurants which offers more variety and the chance to buy directly from the artist. Peg's Cantina & Brewpub is a great spot to finish the night with a good meal. The small town of Shepherdstown in West Virginia is a delight. They support the arts, enjoy good restaurants, art galleries, a farmer's market and fun shops. The Bistro 112 on the main street not only has excellent food but also an electic art collection on display. It is part of the owner's personal collection. She is happy to tell you about each artist , where she bought it and why. And for an added culinary arts bonus, Shepard's Whey Creamery produces superb goats cheese on a farm just outside of town. They sell at the farmer's market during the summer and year round at the farm shop. I personally highly recommend you get some of their Valencay cheese. Shepardstown is a great base to explore the area and visit places like Antietam and Harper's Ferry. Over the Mountain Studio Tour is held in November when 9 studios host 24 artists and they open their doors to the public. They also host a summer show under one roof in Shepardstown in July. They produce an excellent brochure for the November tour with a rough map and information on the artists and a website. It's a pleasant drive through the countryside to get to all the studios and an easy two-day adventure. The pretty little lake town of Meredith, NH showcases the Meredith Sculpture Walk. The pleasure of ambling around viewing 32 highly talented sculptures work in a quaint town with the lake lapping it's shores is beyond relaxing. They have a map on their website with locations and information on each sculpture. There are docent walking tours on offer. Reno, Nev., might conjure up images of casinos and rodeo but they do have a lively arts scene and a monthly art walk. The newly opened Millworks in Harrisburg, Pa., is a treasure trove of restaurants, artists studios and more under one roof. You can't go wrong in checking the Pennsylvania Guild of Craftsmen website so you can visit other artists nearby while you're in town. artistic throughout the country for a week every October. In 2015 all 50 states participated. Logo courtesy of American Craft Week. These suggestions are to get you thinking outside the box and explore new areas. 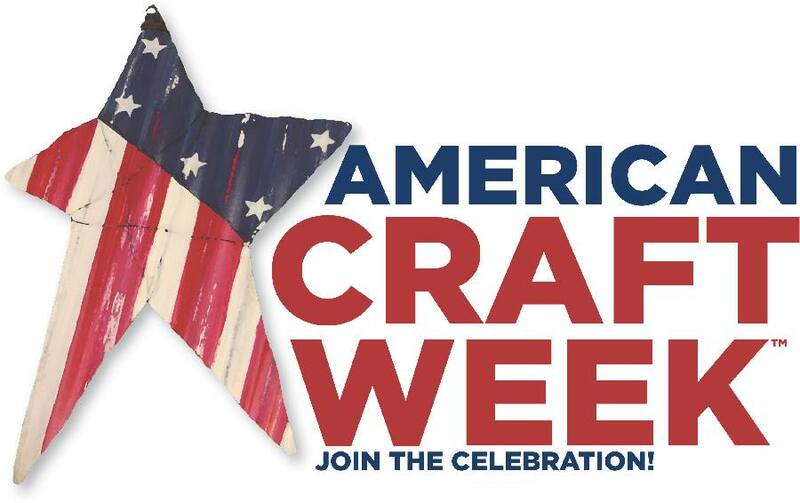 The list is way longer than any one, or even ten, articles could do justice to but for an excellent place to start for something close by to you, take a look at the American Craft Week website. There are artists studios, galleries and organizations from all 50 states listed by state. Their listing changes each year depending on who participates but it is a resource of magic. Also be sure to note the dates of the week long celebration, 7-16 October 2016, and go to any near you. It is a wonderful guide to support local arts. 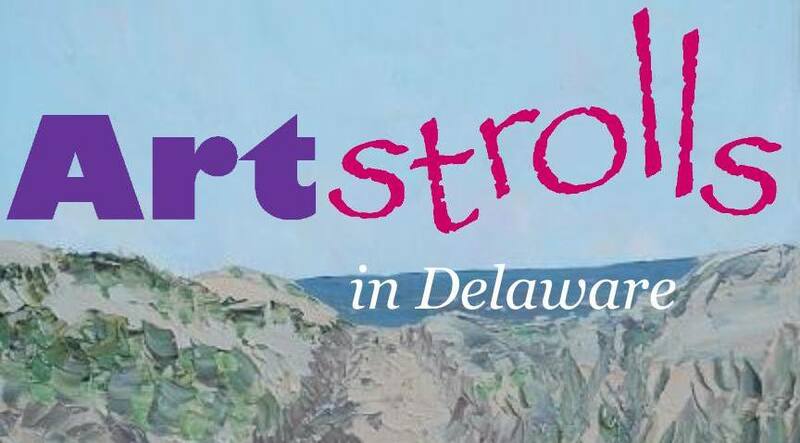 the arts featuring big museums, public art and rural art studio tours. If you want to explore just one state, Vermont, Maine and North Carolina might be the big dogs but don't miss Utah's burgeoning art scene in Ogden and St. George, little Delaware has an entire magazine on their arts scene or Edmonds arts tour in the North West state of Washington, they will surprise and delight you. The main thing is to hop in the car and head out, explore and buy art from local artists, crafters and magic makers.